Callie's Memory is a lovely combination of salmon pink, orange and copper. She enchants everyone who deserves a worthy look of her. Though she only lasts four days, she is beautiful at such a level that we take her durability for granted. Callie’s Memory is a relatively young variety. She was registered by Anderson in 1999. Callie’s Memory is part of the famous Itoh family. An Itoh is a cross between a tree peony and a lactiflora. 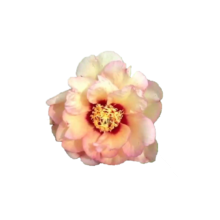 As a result, the flower has more trouble absorbing the water once it gets cut off. This also means that they are less durable. Fortunately, we created a new diet consisting of sugars for these flowers. We can now guarantee you a vase life of at least four days. Is the effort worth it? Well, even though she will only bloom for a few days, she will lighten up your house with her beautiful colours. Another member of the Itoh family is Bartzella.